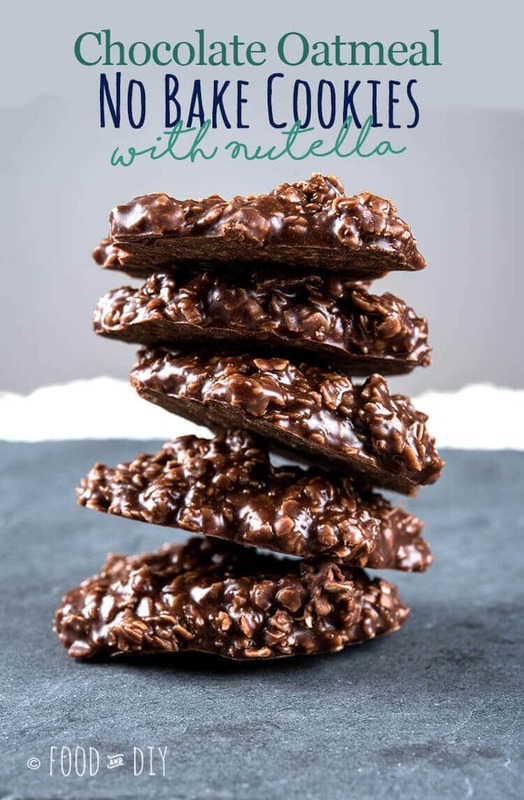 Take classic, chocolate no bake oatmeal cookies up a notch by adding nutella! These cookies are dreamy! 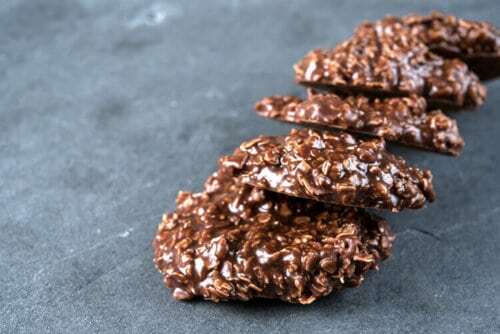 When I was growing up, I made classic chocolate oatmeal no bake cookies all the time. We’re talking at least once per week. The ingredients were cheap and we always had them on hand. I made those cookies so often that I didn’t need the recipe anymore, I had it memorized. Back then, if Nutella was around I sure didn’t know anything about it. But now that I have a seriously strong attraction to anything and everything with Nutella in it I knew that I wanted to try these cookies with Nutella in them instead of peanut butter. You can basically use the original classic recipe, just substitute the cocoa and peanut butter for Nutella. Do you love Chocolate Oatmeal No Bake Cookies? Would you try them with Nutella? Tell me in the comments below ↓. Remove the pan from heat, stir in the Nutella until blended together and smooth. Add the oats, stirring until they are mixed in evenly. Line 2-3 baking sheets (depending on the size you have) with wax paper. Drop the cookies by rounded tablespoons evenly onto the wax paper. Let the cookies sit at room temperature for 15-30 minutes until they are cooled and set. If you boil the butter, sugar, and milk for less than 1 minute the cookies will not set up properly and will be sticky and wet. If you boil the butter, sugar, and milk for more than 1 minute the cookies will end up dry and crumbly. However, if you live in a humid climate, and it is very humid while you are making these cookies, boiling the butter, sugar, and milk for about 1 1/2 minutes is a good idea. The humidity in the air can make the cookies not set up properly as well. I live in Oklahoma and only when it is very very humid or raining outside do I have to boil for 1 1/2 minutes. Pinning for later or sharing this recipe with your friends is so appreciated! Simply click the share button of your choice over on the left ←. 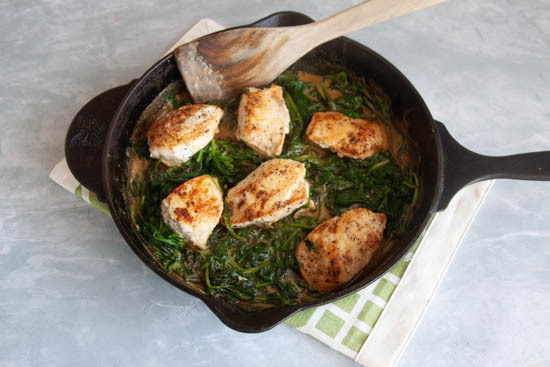 This creamy chicken & spinach skillet is SO flavorful! Garlic and parmesan cheese collide and have a party in your mouth! These cookies look so delicious! I love that you used Nutella in them – yum! 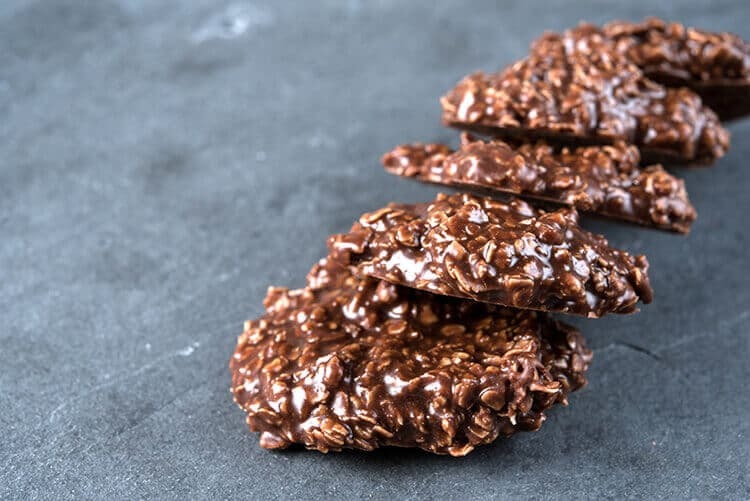 Some of my favorite cookies growing up were the no-bake chocolate oatmeal. Can’t wait to try these Nutella ones! They are great! I hope you love them! Thank you for linking up to my site, Anna — I’m glad you liked my Nutella Oatmeal cookies! If you love easy yet delicious recipes, fun, farmhouse inspired DIY projects, and gorgeous home decor then you've come to the right place!! Grab a cup of your favorite drink and take a look around! click here to read more about me. 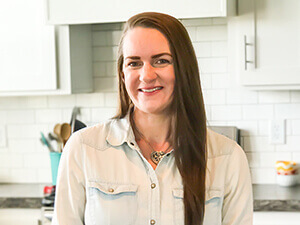 Food and DIY is a participant in the Amazon Services Associate Program, which is an affiliate advertising network that helps me to earn a commision by ads and links to Amazon products and services (at no additional cost to you). I also accept sponsored posts. All are clearly labeled. This helps to offset the costs of providing free recipes and DIY projects. My full disclosure policy can be found here: Disclosure Policy.